There is something so eternal and comforting in this promise that no matter how much the Adharma appears to rise in this world, there will always be Dharma to defeat it and restore balance to our world and keep it livable for normal humans. This is so fitting in the Hindu philosophy which notes and promotes the cyclic nature of the universe and events that take place in it. We believe things are created and everything is peaceful and harmonious in the beginning in Satyug. But the universe has a fundamental duality – Purush and Prakriti, Shiva and Shakti, Mass and Energy – whatever you name it, so Good also has a twin called evil and Dharma has Adharma. So Satyug is followed by Tretayug and then Dwaparyug. And in all three of these yugas, Vishnu manifests through various Avatars to restore balance to our world – namely Matsya, Kurma, Varah, Narasimha, Vaman, Parshuram, Ram, Krishna, and Buddha so far. The last and final yuga is Kaliyuga – the age of evil. And the Puranas promise us that the last Avatar of Vishnu will be born as Kalki. Riding on a magnificent white horse called Devdatta, with a parrot called Shuko on his shoulder, he will roam this earth and free it from the Adharma of the current age. Kalki Purana is devoted to forecasting his life and chronicling his adventures. And it is the Kalki Purana that has served as an inspiring starting point for Kevin Missal‘s series imagining the life and adventures of Kalki in a land called Illavarti, very similar to India. However, the time where these adventures take place is nothing like the present world. It is a world made of Manavs and Tribals (Rakshas, Nagas, Suparnas, Yakshas, Mechhas, and Asuras), as we saw it in the first installment of the series – “Dharmayoddha Kalki – Avatar of Vishnu“. 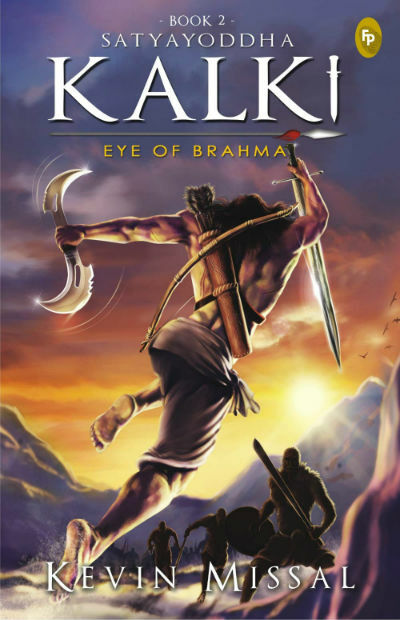 Fingerprint Publication has provided us the first two installments of the series for our genuine review and for Team Thinkerviews, I have loved reading the series and here are my thoughts on the second book of the series called Satyayoddha Kalki – Eye of Brahma. The cover page for this book has the same attractive, vibrant colour scheme as Dharmayoddha Kalki. We see the back of a powerful warrior, holding a double-edged sword in his right hand, a double-headed ax like weapon in his left hand and carrying a bow and quiver of arrows on his back. The warrior is shown in a flight for attack and facing him are three Vanars in a mountain landscape with a setting sun at their back turning the sky red. The books have a very appealing and positive visual effect and will draw readers in without a doubt. Let’s take a quick look at the story. But the road looked very dismal for Kalki at that point when he escaped Kali’s hands and had no other option but to start his journey to Mahendragiri with Kripa, Padma, and Shuko, leaving everyone he loved behind, and dead. As we meet them in this book, they are on this journey and right away they fall in with the Simhas. While the Simhas appear not so harmful by themselves, they are taking the captives to Pisachas, who are well and truly cannibalistic enemies and all captives – Kalki, Kripa, Padma, and three apsaras – have nothing to look forward to except death. From here on, the book follows three different tracks – adventures of Kalki, events that happen in Indragarh including Kali, and the story of Manasa after she arrives in the Naga kingdom. For the sake of simplicity, we’ll stick to each track separately. In Dharmayoddha Kalki, Manasa survived an attack from Kali’s men, after her brother Vasuki was murdered. With revenge in her heart, she comes back to her kingdom to gather forces. But things have altered in her presence. Vasuki’s entire family has been murdered and their house has been burnt by the archenemies of Nagas – The Suparnas. A faction of Naga council has made a truce with Suparnas for Somas and Amrit that the Suparnas have in abundance and Vasuki’s family was the price. Manasa finds herself with no allies except her ex-husband Nanda. She visits Vibhisana in Bhanmati who reluctantly agrees to help, but by the time Manasa arrives to meet Tarakshya – the king of Suparnas – his capital is on fire. The Nagas are burning the entire supply of Somas. Were all Manasa’s efforts in vain? Will she die like rest of her family with nothing in return? In Indragarh, Kali’s madness continues. His latest fetish being gladiator like fights between prisoners that end only with the death of one fighter. He happens to have a favourite prisoner though whom he keeps alive through all fights so he can recover from broken bones only to repeat the process. This is none other than Arjan, who has been repeatedly thrashed within an inch of his life, but isn’t dead yet. But Kali also has his megalomaniac moments when he gives away money and jewels to those in need. In a last attempt to overthrow Kali, Vedanta joins hands with Kuvera, only to be betrayed and murdered. Vedanta’s thirteen year old daughter Urvashi finds an unlikely saviour in Kali’s sister Durukti, who hides her from Kali’s soldiers. Young Urvarshi, however, is a surprise package and knows black magic. One night she hypnotises the prison guards and frees all prisoners on a condition that they form her army. Soon Urvashi manages to overthrow Kali and murders Kuvera to become the youngest queen in history with Arjan as her chief adviser. But Arjan’s troubles are far from over. He looses too much in Urvashi’s reign and turns into a killer he thought he would never be. Kali and Durukti manage to escape with help of an old man who calls himself Shukra. Shukra tells them the old tales of Asura empire. In the Asura version of the prophecy, there will be a last remaining Asura man who will be Dharma and fight Adharma during Kaliyug. Shukra takes them to the lost Asura kingdom of Pataal where they meet a woman called Alakshmi. Shukra has it all planned – Kali is the last remaining Asura, he must marry Alakshmi to produce Asura heirs and fight Kalki. But he has a lot more to show Kali that hits him with a force of a sledgehammer and giants. Besides, is Shukra who he says he is? Meanwhile, Kalki and his companions have to fight Pisachas if they want to live. Kalki defeats the Pisach leader Brahmputraksh and they carry on their journey to Vanarvata to meet Lord Bajrang, Hanuman. In this beautiful land of cherry blossoms, snow capped mountains and forests where seven magnificent rivers merge, they find that everything is not well. A part of Vanars led by General Taar is rebelling against Lord Bajrang. A Vanar of mythical abilities, Lord Bajrang promised Ram (Lord Raghav) to remain non-violent for rest of his days and now some of his Vanars are finding that the cause of their current sufferings. General Taar has joined hands with Kali and now has a troop of Rakshas to help him in the battle. If Hanuman doesn’t fight, who will fight to save his Vanars? For Kalki though, his stay in Vanarvata gives him a lot more insight into himself and confidence, even more than when the Shrivatsa magically appeared on his chest after he defeated Brahmputraksh. He also finds his Devdatta here. Is he ready to be the saviour then? 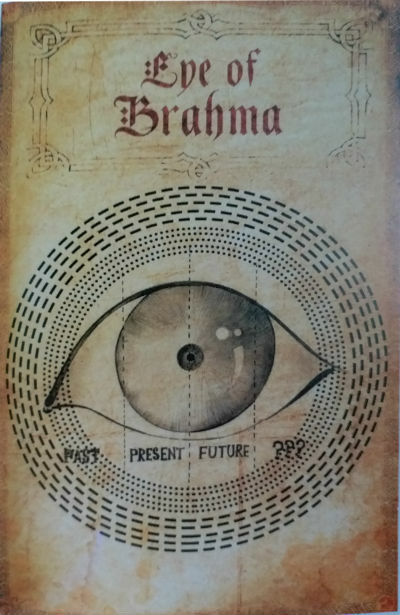 Since the book is called “Eye of Brahma”, you are probably wondering where is that in all the storylines we have above. Well, the “Eye of Brahma” is now no more than four shards of glass – one can show past, one can show present, one can show future, and the last one can show “what-if”s, i.e., all possible outcomes of certain actions. After the Breaking, the eye was “lost” and now the four shards are at four different places. And trying to keep spoilers out here, the sea to Pataal can show past, Hanumaan sees everything as it happens and Manasa now can predict outcomes of her actions !!! Kalki Hari has to get to Mahendragiri and be ready for the war, but can he do it in time? Or is it too late already? The storytelling has definitely gotten a bit better in Satyayoddha compared to Dharmayoddha, probably because the premise is more familiar to the readers now and we have some idea of what the characters are like. There are lots of new characters and twists and turns of the plot that keep the story engaging. As Kevin Missal mentions in the note in beginning, he has been inspired by some of the great movies while writing this book and that can be felt as he creates different tribes, fights and battle scenes. There is a lot of momentum in all three tracks as the characters are forever travelling and coming to face unforeseen complications. Kalki channels a few more Avatars in this book and both Narasimha and Varaha are quite impressive with their different philosophical takes on their actions. Kevin Missal also tries to highlight that all his characters have something good and something bad in them. None of them are perfect and they all act to suit their circumstances. That when forced by life and faced by great loss, we all have the capacity to kill, no matter what doctrine we have been raised in. One of the best segments in the book is how the ideological struggle in the Vanar tribe has been described. Even if you isolate yourself from the world, the world doesn’t leave you alone. And if you live with ideas that came to life in a different age, they don’t always make sense to younger generations who are the product of a different age altogether. That it is so very easy to see non-violence and inactions as cowardice and lack of care for people around you when you don’t lift a figner to save them. But then, life and death are part of the universe and if you save someone today, there is no guarantee that something else won’t happen to them tomorrow. Borrowed lives can last only so long…However, this lack of understanding is enough to lead to a civil war and destroy the tribe from inside. 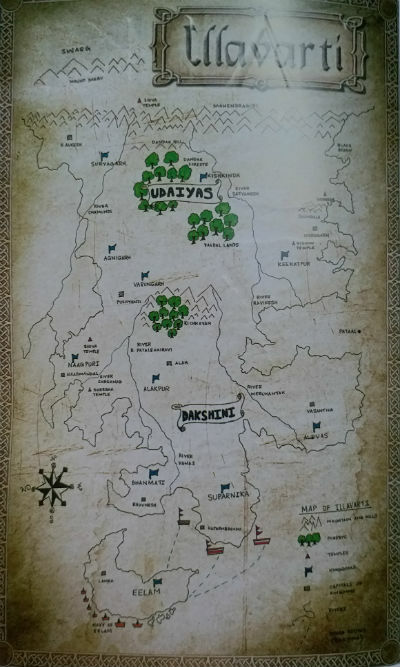 We do like the timeline and the map of Illavarti, which remain unchanged from Book one. As you can see, the North is called Udaiyas comprising of Indragarh, Varungarh, Suryagarh, Agnigarh and Dandak and the south is called Dakshini including Suparnika, Naagpuri, Eelam and Bhanmati. Then there are the lost islands of Pataal, where the Asuras came from. There is a lot of action in this book, so the dialogues are short and interchanges are quick, funny and sarcastic at times. The characters might live in Illavarti of unknown times, but they speak like us :). Similar to Dharmayoddha Kalki, this book also has quite a lot of typographical errors and proofreading mistakes. Lack of space between what and he.. The sentence should start with If.. The garment referred here is tunic. Some of these errors are probably thanks to Autocorrect function in Word, and some are an oversight because the human brain supplies the missing letters automatically when you are reading :). But it is something that would be worth correcting in the next editions. Wasn’t the king supposed to be kind, give the poor shelter, help them when they are in need, protect them from an adversary? One couldn’t deny the pleasing effect of doing nice things. Although being violent had its own perks. Perhaps it is necessary for us to fail because it gives us the opportunity to succeed. Without failure, we will never learn and if we don’t learn, we’ll never succeed. One receives the truest and purest strength from self – belief. There is goodness in the world, but there’s no ability to realize it within you and the few that do, they become quite prosperous. You are not born an Avatar. Your deeds make you one. I did give you the Somas to make you powerful, to keep you alive, but remember that an Avatar is made of the deeds he commits, either good or bad; that is what defines him as a hero. You were just a young boy from Shambala who thought that he was an Avatar. But the Shrivatsa brands you with absolute confidence that not only should we believe in you, but the Gods do too. Karma doesn’t make you a god, your deeds do. In our opinion, what is Karma made of, but our actions and their consequences? And hence, our deeds make our Karma which has the power to make us heroes. May be Karma here means destiny or fate. But if we believe in reincarnations, then we also need to believe in the fact that our actions today are responsible for our luck or fate in future. And this is the beauty of a written word. For every reader, the interpretation can be different. We can create our own picture of Satyayoddha Kalki from the world that the author has created. When you are Endowed, you must hide from the world, letting no one suspect that you will live forever since it would be considered magic and magic is something only few believe in. So far, in this series, we have met six out of the seven Chiranjeevs. As you read it, hopefully you identify these too and lets see if the seventh one appears in the next segment :). He was the perfect man, that’s what my gurukul taught me, the perfect man who did perfect things and strived to create a perfect society. But what is so great about perfection? I would break every word, every oath if it means I could save a single soul. I would break it without thinking twice. I don’t care if I am thrown in hell and I’m considered disrespectful because of it. Dharm is not just made of strength, but of kindness as well. Being a hero doesn’t mean defeating the enemy. Its also about giving them second chances. At least 8 out of 10.